A grass-roots group of gardeners and community activists is turning two overgrown lots in Homewood into an urban farm, seeking to expand access to healthy food and improve the collective well-being of this once-fertile neighborhood. The group, called the Black Urban Gardeners and Farmers of Pittsburgh Cooperative — or BUGS, for short — is preparing to cultivate the neglected land with all kinds of organic fruits, vegetables and herbs, including peppers, squashes, cabbage, collard greens. “We’ll always be growing food,” said Dana Harris-Yates, a shaman medicine woman who uses “AL” after her name, a Moorish title indicating “one who mastered psychology and healing.” She is a program manager for the BUGS group and is overseeing the Homewood project. Tucked along Monticello Street, a residential side street in Homewood North, the two lots stretch over a total of 31,000 square feet. They are about a half-block from Westinghouse High School, where teachers and students created an organic garden this past spring. In addition to providing food, the land would serve as an outdoor classroom for middle and high school students as well as a space for people to practice meditation, reiki, yoga and the like. It would also include a labyrinth and a healing garden yielding medicinal herbs, including ones used to ease mental health problems such as anxiety and depression. Research suggests that gardening, and even the presence of green space, can have positive physiological and psychological effects. “We know our community has experienced a lot of trauma,” said Ms. Harris-Yates, who grew up in Homewood. An herbalist and an energy healer with a background in Western psychology, she has created a therapeutic farming program for children that is intended to deepen their relationship with the natural world. “This will help heal the children,” she said. The group bought the long-vacant lots from the city last year. They are being tilled and weeded, and a groundbreaking ceremony is expected to take place next month, Ms. Harris-Yates said. In October, the group plans to begin sowing seed and building movable greenhouses, or hoop houses, that would grow food year-round. Created a couple of years ago, BUGS works to improve quality of life and create economic stability in the black community, promoting urban agriculture and natural healing as integral to such efforts. It comprises a little less than two dozen members around Pittsburgh, including in Larimer and the Hill District. While all of its members garden, the planned farm is the first such collective undertaking by the group. It organized its first farmers market last year in Homewood. “Growing your own food, putting your hands in soil, is one of the most revolutionary things you can do,” said Raqueeb Bey, the group’s founder, who runs Grow Pittsburgh’s Garden Resource Center in Larimer. Lending tools and soil amendments to backyard gardeners, the center opened a couple of years ago. The group also focuses on social justice issues, challenging institutional racism in various sectors, including urban agriculture. “There has been progress with our white counterparts,” she said. Homewood has one of Pittsburgh’s highest crime and poverty rates, and its streets are rife with blighted and vacant lots. Although it is home to a couple of farm stands, regular access to healthy food is limited. The East End neighborhood is experiencing what Ms. Harris-Yates called a food apartheid; it has no local grocery, only corner stores where wholesome food is scarce. Nonetheless, efforts to restore the economic and social fabric of the community have taken root, including not only gardening projects but also youth outreach and senior programs. Next to the entrance of Westinghouse High are 10 raised garden beds fashioned from recycled plastic. They are tended by a handful of teachers and their students. 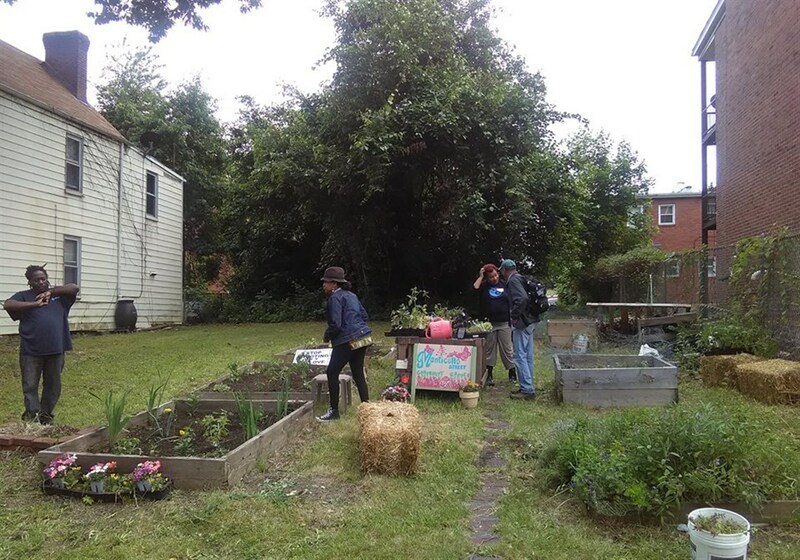 Using land in Homewood for growing food and green space is neither novel nor idealistic. Years ago, fruit trees and gardens abounded here, Ms. Harris-Yates said. Reviving a more agrarian-minded community, she said, rests largely with younger generations.